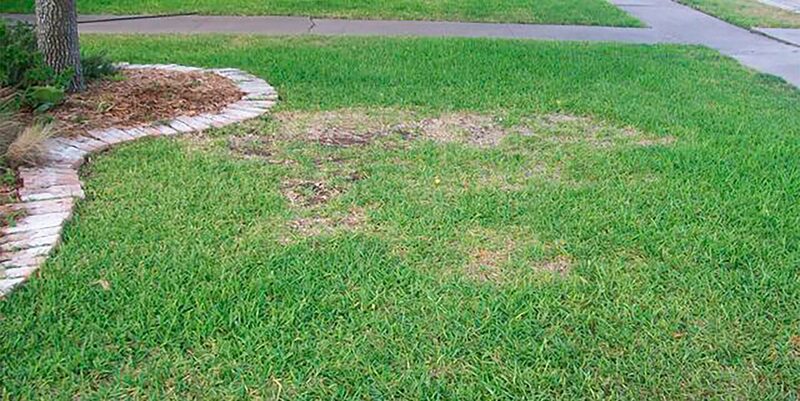 In recent years, a fungal disease that infects the underground organs of turf grasses has wreaked havoc on Texas lawns. This disease, commonly known as Take-All Root Rot (TARR), is caused by the pathogen Gaeumannomyces graminis. The fungus grows in a web on the surface of the roots and causes them to become completely rotted and shriveled and, thus, can no longer function as an efficient root system. The fungus is highly active during the mild temperatures of the spring and fall. However, effects of fungal activity can extend into summer, when the turf can become yellow, thin, and grow weakly. While all species of warm-season turf can be affected, stressed turf, and particularly St. Augustine, struggles the most with TARR. Symptoms associated with TARR usually appear in late spring/early summer and can include: yellow patches of grass in the lawn, irregularly shaped thinning spots, dry spots that do no respond to watering, brown to black roots, and ultimately, dead turf. If left completely untreated, this fungal disease can decimate entire lawns. Unfortunately, there is no quick treatment that solves the TARR problem. Therefore, when CHI horticulturists come across this disease on a client’s property, they proceed with a multi-fold approach. Using knowledge of the disease to effectively attack the pathogen, in conjunction with increasing the health and vigor of the turf, CHI horticulturists can greatly improve the prognosis of an infected lawn. Treatment strategies include application of fungicide when the pathogen is active, aerating and topdressing with peat moss to introduce organic matter and alleviate compaction, raking and removing infected plant material, and sulfur applications to reduce pH. There is still more research to be done to fully understand the disease and effectiveness of certain treatments, but it is understood that the long term success greatly depends on a holistic care program that increases the tolerance of the turf to stress factors* and fosters a healthy growing environment through proper mowing, watering, and fertilization programs. * Common stress problems found in lawns include: excess shade, thatch, soil compaction, poor drainage, drought, high temperatures, improper use of herbicides, over fertilization, and excess supplemental irrigation.